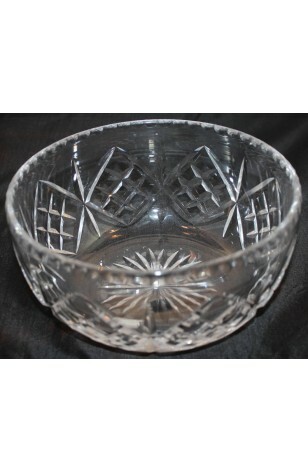 Vintage, Waterford Cut Crystal Serving Bowl, in Pattern #WAT10, Produced in the 1950's. Vintage, Waterford Cut Crystal Serving Bowl, in Pattern #WAT10, Produced in the 1950's. A quite Lovely Vintage, 8" Round Cut Crystal Serving Bowl by Waterford Crystal in Pattern #WAT10. This is a Criss-Cross Design in Diamond Shape with Vertical Cuts between the Diamonds. It has a Rim that is Scalloped, and a Cut Base. Truly Beautiful. In Very Good Resale Condition unless otherwise noted below or seen in pictures.